A lot of artists decide they’re going to build a website, jump online, Google a few website options, and then pick one at random because they don’t have good criteria for making an informed decision on how to purchase a website service. 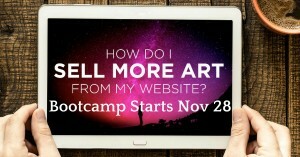 As we’re leading up to the Artist Website Bootcamp, starting next week on Monday November 28, I’m getting lots of questions about how to get started on a website. Here are a few quick tips. Do your research. Most artists don’t do this. For most professional website builders, they’ll spend as much time doing this as they’ll spend actually building the site. They’ll not only research competitive website and sites similar to what they want to build, but also build out swipe files or pinboards. They identify how the website is going to stand out before it is ever built. This blog post talks about the need for market research and how to get started. 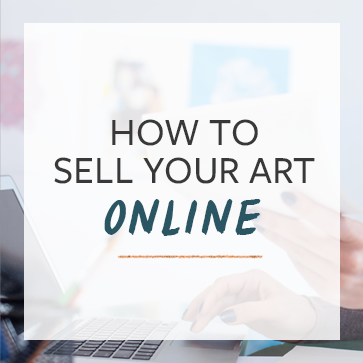 Our upcoming Bootcamp and course, Artist Websites That Sell, goes deep into how to do that research. Understand what’s available. Do you know the difference between WordPress.com and WordPress.org? How is Shopify different from Squarespace, and how are all of them different from the various artist-specific website offerings like ArtStoreFronts or FineArtStudiosOnline? Here’s a hint: decide what you want your website to do before you evaluate the services. Check out the artist website checklist, a free download for understanding what should go on your website. Also check out our guide for picking your artist website. Here’s our guide on how to get started with ecommerce. Sign Up for the Bootcamp. We start Monday, November 28. Each day at 8:00 AM Pacific Time, we will have a one hour call for you to ask questions about your website and see how we help other artists build great websites. Click here to sign up for the bootcamp. Spaces are limited. As of right now, there’s only 12 spots remaining.